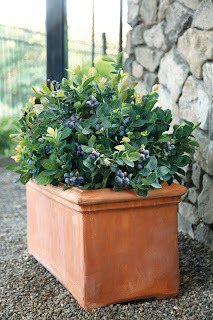 The Garden Plot: GMG's Friday Find: Celebrate National Blueberry Month! GMG's Friday Find: Celebrate National Blueberry Month! July is National Blueberry Month, a perfect time to celebrate the mighty fruit, and we invite you to grow, eat, and cook with this powerhouse nature provides. The health benefits of blueberries are widely known and continue to get attention as studies find even more super benefits from blueberries. Among fruit, blueberries have the highest total antioxidant to help us fend off disease. They reduce belly fat, prevent hypertension, improve memory, and help to reduce the risk of colon cancer. And let's be honest, they are delicious! 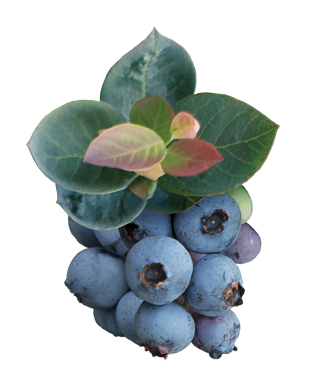 Buying organic blueberries is a wise choice, and planting up your own from Fall Creek Farm and Nursery, Inc's BrazelBerries™ Shrub Collection is an even better choice! These compact blueberry plants not only provide incredible fruit, their foliage is truly lovely as well, from spring to fall. And how convenient can it be to pot up a container and pick your fruit fresh right off your deck or patio. There are endless ways to use blueberries, from straight off the vine to salads, drinks, muffins, cakes - you can add them to practically any dish that you imagine. We've pulled two great recipes for you to consider enjoying this powerful fruit. Spoon oats into heatproof bowl and mix with the salt. Cover with boiling water and allow to stand for 10 minutes. Place the soaked oats in a blender with the berries, honey, and 4 tablespoons of yogurt. Blend well and scrape the sides of the blender as needed. 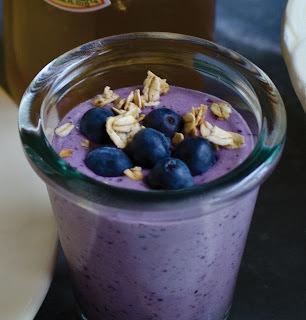 Pour blended mixture into two glasses and swirl 1 tablespoon yogurt into each glass. Garnish.. Cream the butter and sugar. Add the eggs and vanilla. Add flour and baking powder. Stir. Grease a 9"springform pan. Sprinkle 2 cups of blueberries on top. Sprinkle with the sugar and cinnamon. Bake at 350 degrees for 45-55 minutes. Cool cake for 10 minutes before removing the form and sprinkle with powdered sugar. Can be served warm. And no worries if you have lots and lots of blueberries, you can freeze them without doing any damage to their antioxidant power, which means you can grow, enjoy and store for year-round pleasure. Happy National Blueberry Month!